Can you identify the Bulb Festival Queen? 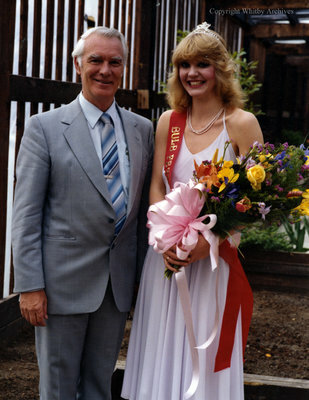 A colour photograph of Leonard Cullen standing with the Bulb Festival Queen at Cullen Gardens. The Bulb Festival was a spring show of bulbs planted throughout Cullen Gardens and Miniature Village. The festival ran from mid-April to mid-May with events held on weekends. Bulb Festival Queen, c.1982, Photographer Unknown. Whitby Archives A2013_042_269.